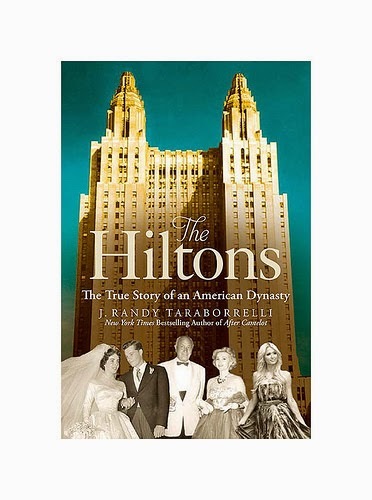 I recently finished a great book, "The Hiltons, the True Story of an American Dynasty." Don't worry, there are only one or two chapters about Paris, I promise! The story focuses on Conrad Hilton as he builds the Hilton Hotel empire and the many struggles he faces, along with the sometimes tumultuous story of his children and personal relationships. What you may not know is that Conrad was once married to Zsa Zsa Gabour, and his son Nicky was actually Elizabeth Taylor's first husband. As a result, the story is intermingled with tales of old Hollywood and life in Beverly Hills. What I really loved about the story were the accounts of the glamorous, old world parties and dinners Hilton would throw. While Hilton was fairly frugal with his own family, he spared no expense in celebrating the opening of each hotel. For the "Hilton Junkets" he would fly press, family, and celebrities to the hotel for sometimes weeklong parties, with cocktail receptions, black tie affairs, lunches, brunches, and activities each day. Even later in life (he lived until 1979), he upheld old fashioned traditions, with formal family dinners. I found it interesting that even when he was married to Zsa Zsa, they would eat dinner each night, being served of course, at opposite ends of the large, formal dining table. I would highly recommend this book - an inspirational story of one mans determination to build an empire, rich with history and glamor. I'm thinking of starting up my book club again just so I can host a formal dinner for discussion! I would love to read this! So interesting!